The most important motif components were refined with brilliant colours in an elaborate process. Reverse side: eagle with coat of arms is the same for all coins, therefore only one photo as illustrative. Mintage: Was issued only 10,000 times altogether. 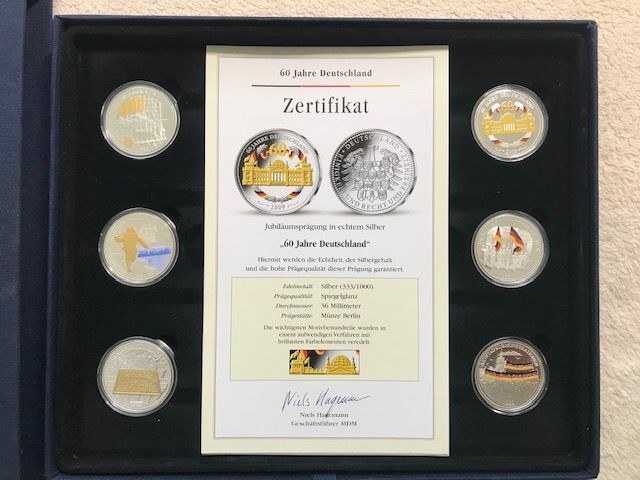 MDM Münzhandelsgesellschaft mbH - description is supplied with the coins in a velvet box. 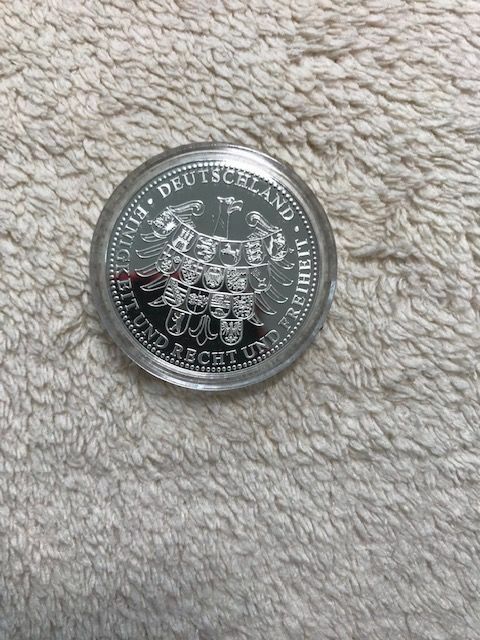 1st Coin: '60 Years of Germany', Mint: Berlin Mint; Brilliant colour minting as well as individual numbers on the edge. 3rd Coin: Monday demonstrations; obverse: demonstrators with banners; banners reproduced by an elaborate process in the colours black, red and gold. 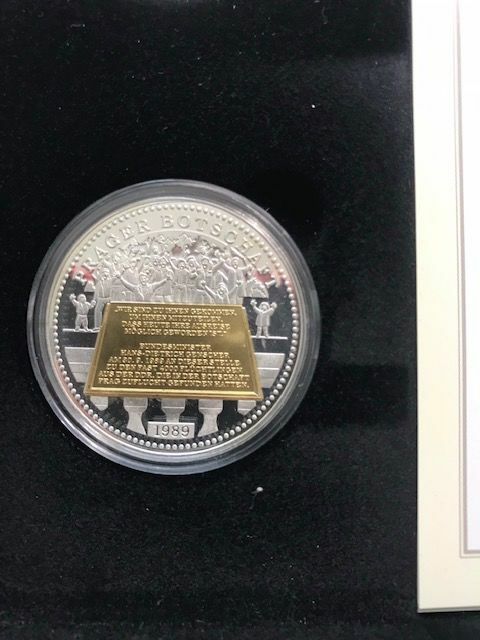 4th Coin: "The Miracle of Bern" Obverse: The winning strike; special feature of the ball and flag, refined with 24 kt gold. 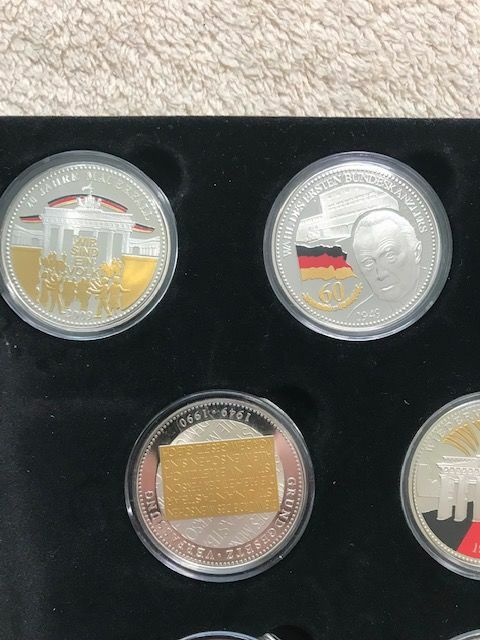 5th Coin: 'Building the Berlin Wall', obverse: Fleeing border guard; border guard and wall were decorated with colors. 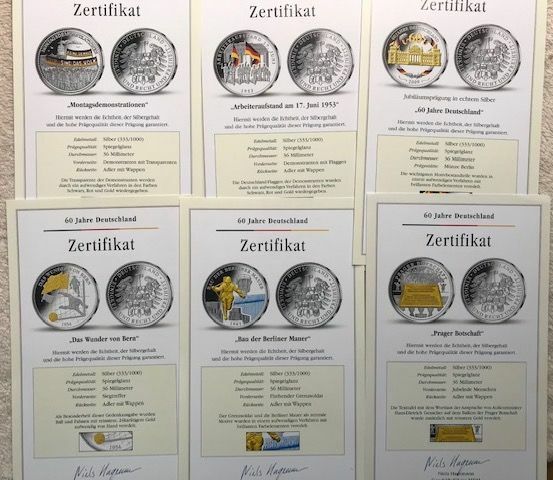 6th Coin: 'Flood of the Oder 1997'; Obverse: Rescue worker in action; parts of the motif have been finished with colour. 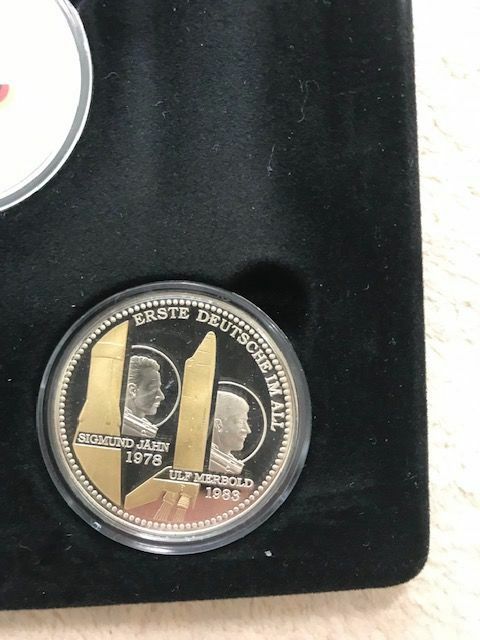 7th Coin: 'The Genuflexion of Warsaw'; Obverse: Willy Brandt in front of the memorial to the Jewish ghetto; The black-red-golden colours highlighted with colour finish. 8th Coin: 'The miracle of Legede'; obverse: miners with rescue capsule; the rescue capsule was refined with fine gold. 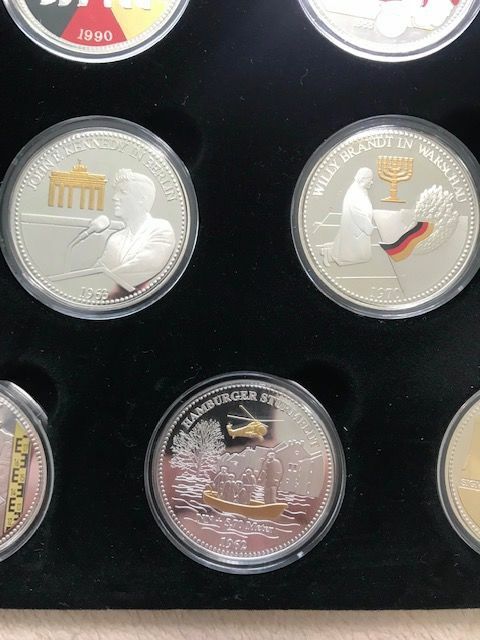 9th Coin: 'John F. Kennedy in Berlin'; Obverse: US President Kennedy in front of the Wall and Brandenburg Gate; Brandenburg Gate was finished with gold. 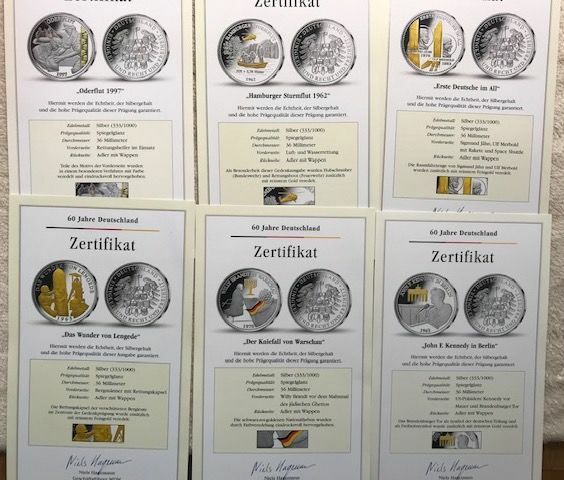 10th Coin: 'First Germans in Space'; obverse: Sigmund Jähn, Ulf Merbold with rocket and space shuttle; spacecraft finished with fine gold. 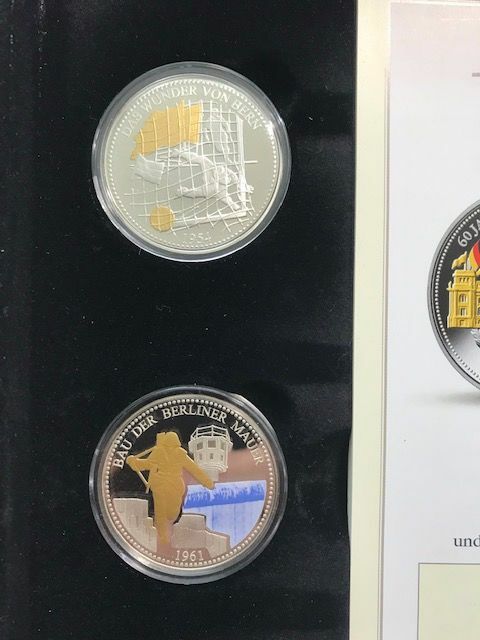 11th Coin: 'Storm Surge in Hamburg 1962'; obverse: air and water rescue; helicopter and lifeboat finished with gold. 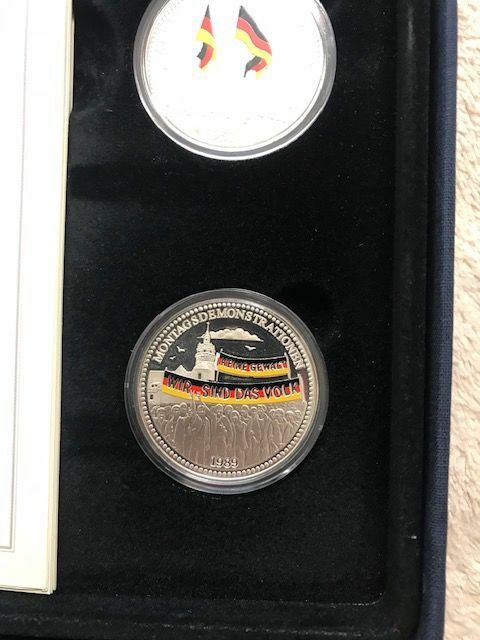 12th Coin: 'The German Economic Miracle'; obverse: Economics Minister L. Erhard; the national colours black, red and gold applied as colour element. 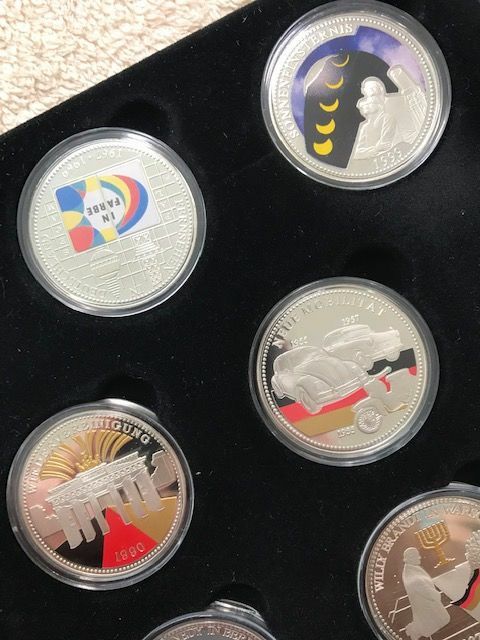 13th Coin: 'New Mobility'; obverse: vehicles of the 1950s; the colours black, red, gold refined by colour application. 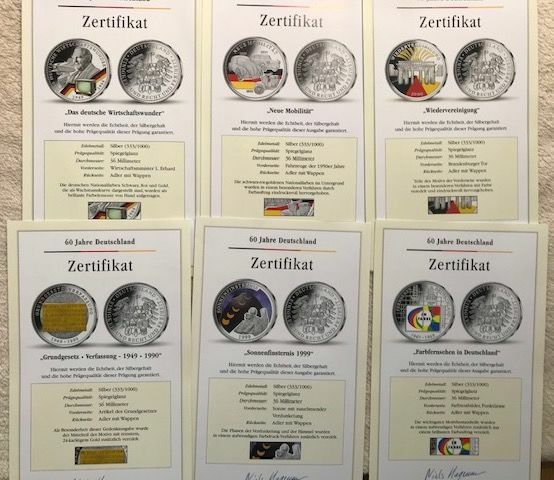 14th Coin: 'Colour Television in Germany'; obverse: colour test pictures, radio towers; The motif components were refined with colour application. 15th Coin: "Solar Eclipse 1999"; obverse: sun with increasing darkening; phases/sky were refined with the colour print process. 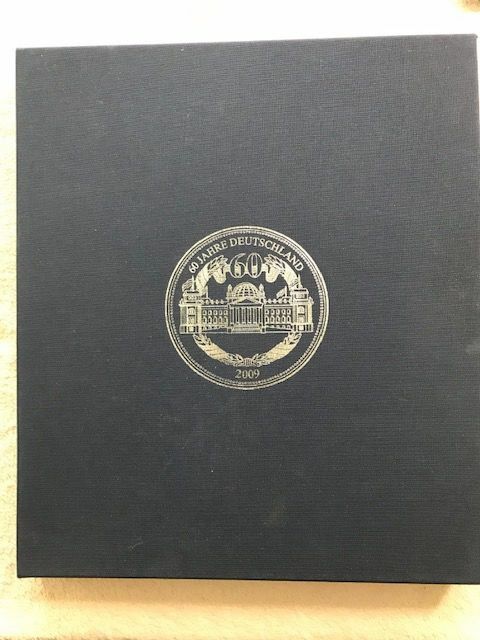 16th Coin: 'Basic Law - Constitution - 1949 - 1990'; obverse: article of the Basic Law; middle section was finished with 24 kt gold. 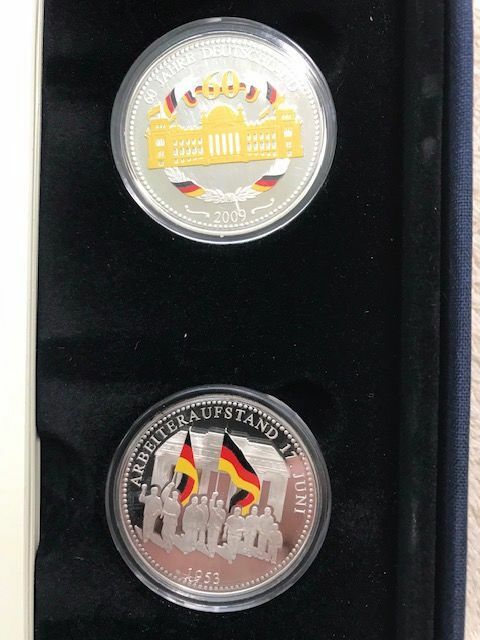 17th Coin: 'Reunification'; obverse: Brandenburg Gate; sections were finished in colour. 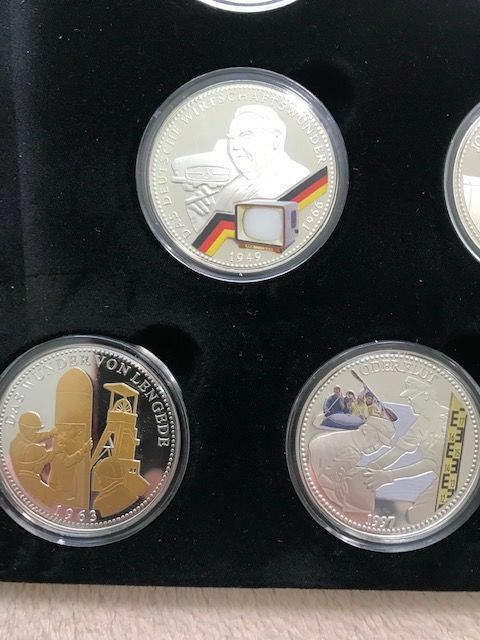 18th Coin: '20 Years Since the Fall of the Wall'; obverse: Berlin Wall broken through in front of the Brandenburg Gate; motif components refined with colour. 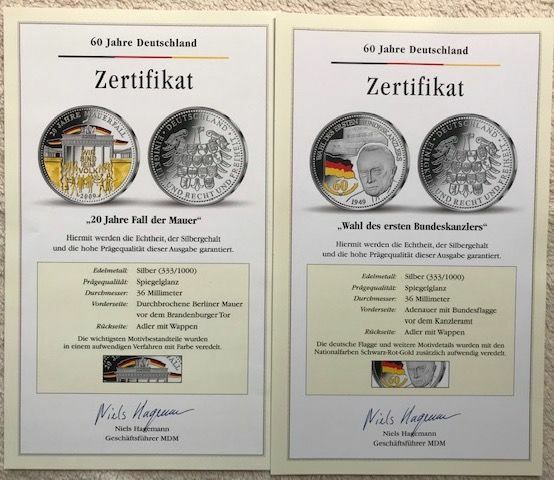 19th Coin: 'Election of the first Federal Chancellor'; obverse: Adenauer with federal flag; flag was refined in the colours black, red and gold.